Wow...wow...wow....GRAND PIANO was so intense! Now, this is not straight horror. This is a Hitchcock-like...neo-giallo with flavors of Argento, Fulci, and Bava. It's going to be polarizing for sure. It has elements that some people will just not be willing to stand for - like it all taking place in pretty much one spot and having dialogue moving much of the plot forward. However, I loved every minute of it. 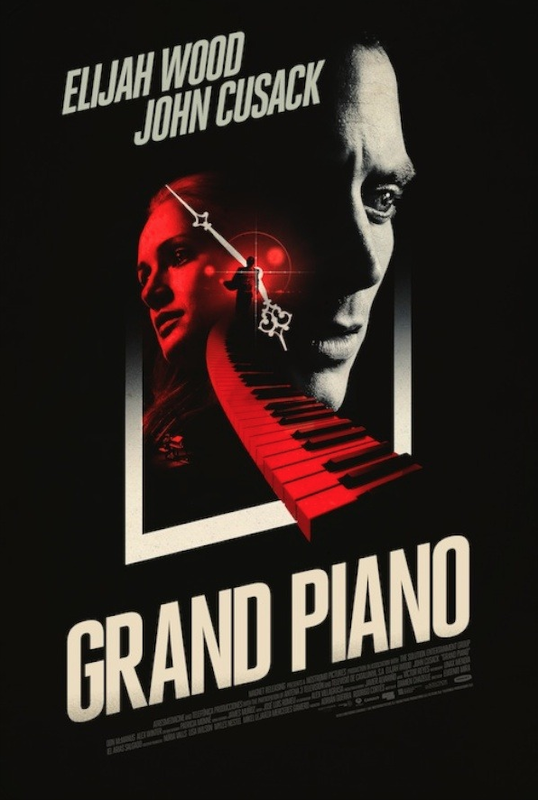 Elijah Wood plays Tom Selznick, a pianist returning to the stage after a disastrous performance five years earlier. Nervous to the point of distraction, he travels from the airport directly to the theater, changing into his tux in the limo and cutting it very close for his arrival time. His wife Emma (Kerry Bishé), a star in her own right, tries to guide him through the best she can while dealing with her own celebrity status and crowds within the theater. As he calms down enough to venture forward - trying to ignore the mean jokes and remarks behind the scenes at the theater, he's shocked to find that someone has left notes in his music pages...and that same someone has vicious plans for him. I was hooked on this film at the AMAZING credits (I was happy to see that they just weren't pretty visuals, too!) and as Wood rushes sadly through to the theater and we start to find out more and more about his backstory, I became more nervous and more anxious. I looked at this as a great thing because it showed that I actually cared about my lead character, not like one of these toss aways one tends to see in horror cinema. As the story went on, I became more and more concerned for Wood's safety. The film itself is a total throwback to Argento in many ways from the camerawork to the color schemes, but it also had it's unique style and differences that made new and interesting, not just an homage. The Damien Chazelle's story was super solid, though it did have some very "giallo trope" aspects that were easily forgiven. Eugenio Mira's direction was kinetic and slick. 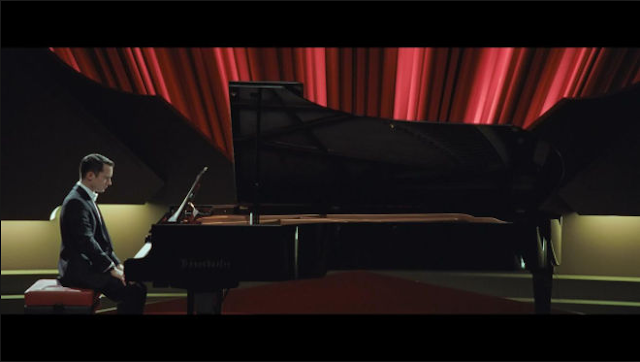 I hope to see more from them - Grand Piano was made way back in 2013. His soundtrack for Nacho Vigalondo's Timecrimes (2007) was released by Mondo on a special limited edition vinyl. As I said, I loved this film. It was a fun and interesting ride! Thanks to Agent Tish for getting it on my radar! Currently on SHUDDER (U.S) at the time of this posting.